Much has been made about Apple's decision to eschew Google's map app that had been a default feature of iOS until the release of iOS 6. Apple's replacement, Maps, has suffered its fair share of criticisms in the early going, and Google has since moved on to improving their maps for Android. The split between the two companies wasn't always meant to be though, according to sources close to the matter. In fact, the latest reports found the departure of Google maps from iOS came down to a dispute over the inclusion of just one feature. One of the key differences between the versions of Google's map app is the exclusivity of voice-directed turn-by-turn navigation on Android devices. AllThingsD's sources claimed Apple wanted that feature included in an updated iOS version of the app, however Google wasn't about to give away one of its defining features for free. These same sources said a deal between the two companies could not be reached once Apple found out Google wanted more say in the development of the iOS app. Google also reportedly wanted to include Google Latitude, but Apple balked at the idea, purportedly shunning Google for wanting to gather so much user data. Apple had been acquiring mapping companies before these negotiations with Google broke down, but only fast-tracked their own app once they realized a deal could not be reached. One source close to the discussions told AllThingsD other factors were involved in the decision, but the lack of voice-navigation was the breaking point. "There were a number of issues inflaming negotiations, but voice navigation was the biggest," the source said. "Ultimately, it was a deal-breaker." Despite Maps poor first impression, Apple still may have made out better than Google. The loss of all those iPhone users previously using Google's app could end up being just as big a disappointment for Google. 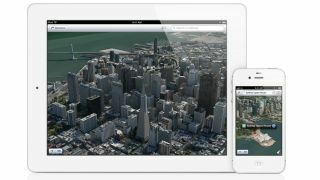 It's estimated Google may have lost some 100 million users dependent on their maps with the upgrade to iOS 6. While Google Executive Chairman Eric Schmidt did say the company wasn't working on an iOS 6 version of their map app, he did seem open to the idea of working with Apple. "We want them to be our partner. We welcome that," Schmidt told investors earlier this week. Whether the two companies can come to an agreement at this point seems unlikely, but it's still not entirely out of the realm of possibility. TechRadar has reached out to both Google and Apple, and will update this story if and when they return requests for a comment.